Hey God! Ummmm…remember last week when I was told my friend that I wanted the flu to jump start my diet? Well, here are my thoughts. If I wasn’t kidding, I would have appreciated the flu with vomiting and diarrhea, you know, the type that makes you drop 5 pounds in 2 days! THAT flu! What you gave me is something else altogether. 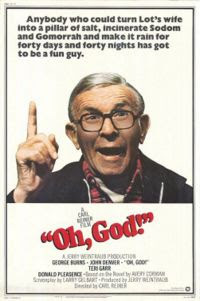 OK…seriously, you know I would only be so sarcastic with the George Burns “God”. But I have learned a few things this week. 1. Ask and you shall receive. Yep, I did ask for this! 2. You can create snot when there is none and successfully turn the flu into a cold. Just take Dayquil for your cough and voila! Snot will appear! 3. Sponge Bob is always on. Always. 4. At least 2 commercials at every break are for fast food. Perfect, I can’t even stomach the thought of soup and I continually get to watch greasy square Wendy’s burgers sizzling on my TV screen during People’s Court. 5. The best medicines, the ones they save for when you are begging like a two year old, those cost the most, which is fine unless you throw them up every time you take one because you can’t keep any food down to help avoid the nausea! It stinks to see an 8 dollar pill come back up in the toilet! 6. There are times that you are sick enough that you don’t care. You just don’t care. Ok, I’ll admit, I did not care about lying on the floor of the doctor’s office. I did not care that I was curled up in the fetal position the entire time the doctor was talking to me. I did not care that I was wearing sweats and a t-shirt literally covered in big fresh wet sweat spots (my husband did though so he made me change). I did not care that I hadn’t brushed my teeth, put on lipstick or even wiped my nose in about 5 hours. Sometimes, you really don’t care! Thank you to everyone who called to check on me, took care of my kids, offered to help and covered for me while I was down and out. I am still pretty down. I think by Monday I will be back in the game. Until then, steer clear of the Michell’s, we stink! Yeah...that whole "be careful what you ask for thing" is true. I've also found that God has a great sense of humor and loves to give you the things you don't want. Even after you've already told him so several times. I swore I'd never live on Heil Ave. The name was scarey and the first time I read it I thought it said "Hell". I'm pretty sure that God pulled a quick one on us. He gave us an incredible landlord, an unbelievable rent that has only gone up $25 in 10 years. The address? Heil Ave of course. I can still hear him laughing on that one! I'm glad you're on your way to recovery. Get well my friends! Oh my holy cow - I didn't realize how hard you guys got hit with this. I will continue to pray that you are feeling better soon. It may come as little consolation while you're feeling so sick but - you're a fantastic writer! Keep blogging - I love reading!